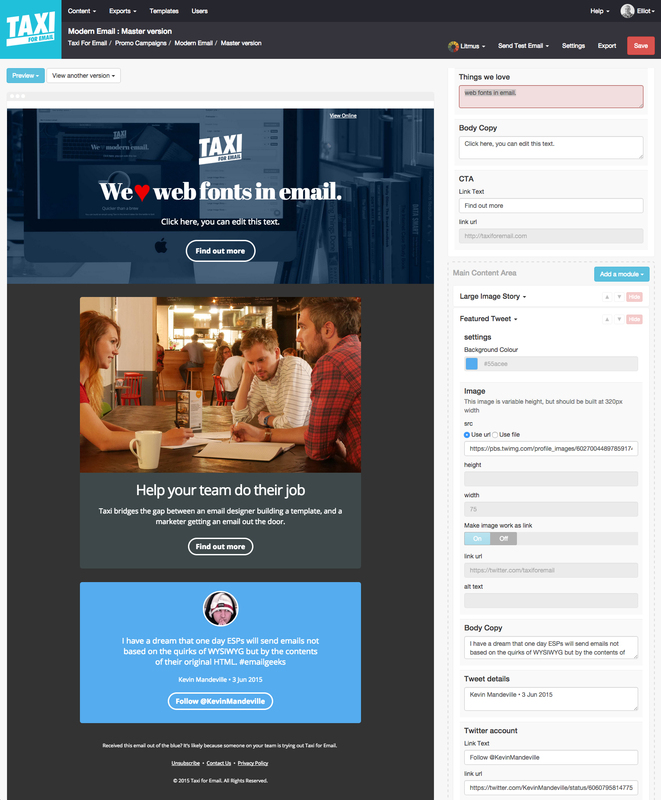 Email design agency Action Rocket just released their CMS and workflow management system for email called TAXI for Email. While the agency uses the platform in house it was in development for over 2 years and closed beta for more than a year. Taxi for email works together with a brand’s email service provider, it does not send any email itself. 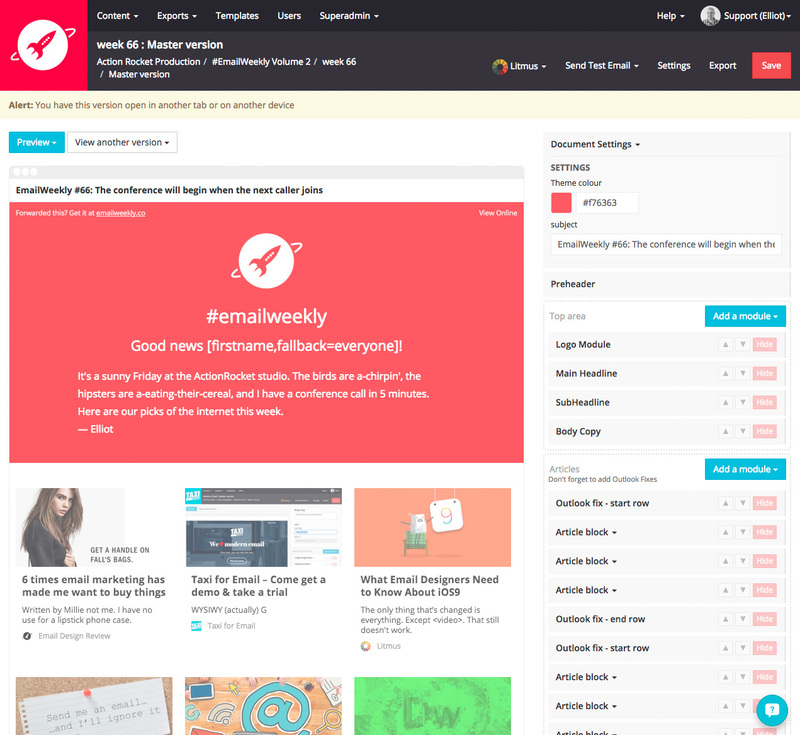 Designers can build an email template and then decide how it can be edited. Key to this is Taxi Syntax, a markup language that determines which areas can be edited and which can’t. Users can subsequently use the visual editor, that shows edits directly as they will appear in the mail at the moment you make changes (WYSIWYG). Marketers can get an overview of progress and manage the team’s workflow. One of the pains in email coding and visual editors is that they try to change or “fix” code. In email sometimes you have to do things that one would not deem acceptable in web coding *understatement*. Taxi promises to leave your code alone and strips all evidence of the visual editor step once you export your code. Taxi has prebuilt templates that marketers can use for email campaigns and iterations. A user can also upload their own HTML to start from. Once an email campaign is complete, marketers can export the code directly to any email service provider to send an email campaign. Export options are HTML + Images or URL publication (for ESPs that allow to import HTML from a hosted URL). Multiple direct ESP connectors are likely on the road ahead. The team from Action Rocket highlights the following points of Taxi for Email. Quick creation of new campaigns. Copy previous templates and settings. Anyone from a designer to a copywriter can edit content. Save costs and time on amends that would usually get sent to a design agency. Controlling how brand elements such as fonts and colours can be manipulated, ensuring brand. as intended when imported to your email sending platform. Direct connect to Litmus to preview email campaigns in over 40 email clients. Bill McCloskey of Only Influencers took the Taxi for a test drive. His story of him building his newsletter through the tool step by step is here. Taxi for email is available right now, with a 30 day free trial. Pricing starts at $ 750 a month.